Saturday October 21st 1893 I was busy about the work all forenoon. Mother and Lee was here for dinner. Mother and I took a ride and spent the most of the afternoon in the cemetery. I took her on home. We stopped to see Old Mrs Kavanah. After supper Will and I went up to Chalfants to spend the evening. They have just got home from Chicago. 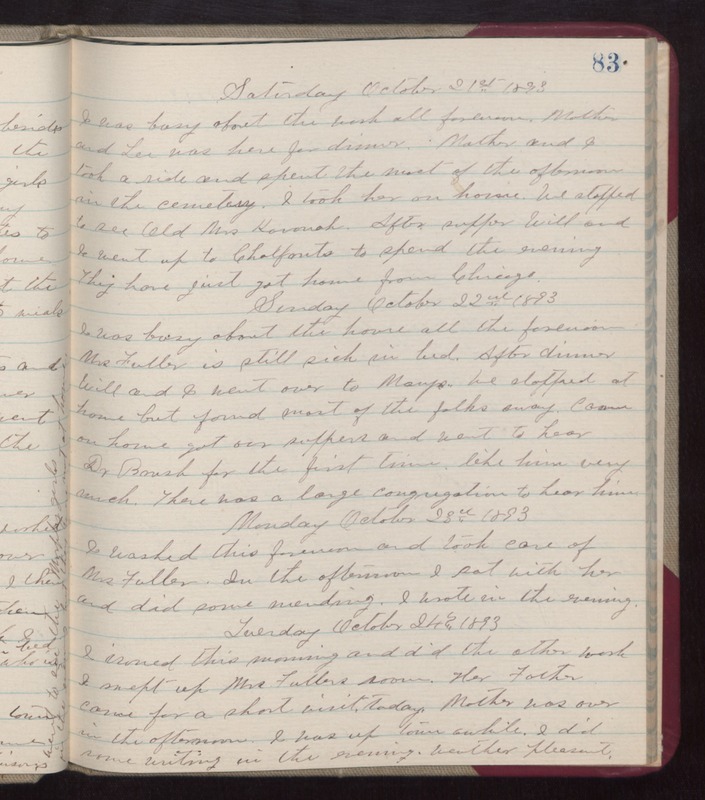 Sunday October 22nd 1893 I was busy about the house all the forenoon. Mrs Fuller is still sick in bed. After dinner Will and I went over to Marys. We stopped at home but found most of the folks away. Came on home got our supper and went to hear Dr Brush for the first time. like him very much. There was a large congregation to hear him. Monday October 23rd 1893 I washed this forenoon and took care of Mrs Fuller. In the afternoon I sat with her and did some mending. I wrote in the evening. Tuesday October 24th 1893 I ironed this morning and did the other work. I swept up Mrs Fullers room. Her Father came for a short visit today. Mother was over in the afternoon. I was up town awhile. I did some writing in the evening. weather pleasant.